We all know that shopping online can be very risky with the advent of new technologies. Determining if an online store is legitimate is now a mandatory part of buying products online. “How can I determine if I’m making a valid purchase?” and “Is it safe to use my credit card?” are some of the questions that may arise during your online shopping experiences. These are very valid questions that everybody asks when making an online purchase. To assist with your online buying needs, use our Online Shopping Checklist to help you make a more educated decision. Lucky for you, the Online Shopping Checklist is available here on Checklist Template for free. All you have to do is download the checklist, open it up in Microsoft Excel, and go through it next time you want to buy something online. The checklist is very easy to understand and walks you through the process of researching both the seller and the product you are looking to buy. Researching the seller or store is the most important part of the online buying process. The checklist template available on this page will tell you to learn the company’s actual name and contact details. You can learn this information and use it to do more online research. Remember to always look up customer reviews on the shop. These reviews and pieces of information will let you get a view of how the company treats its customers and the shipping process of said company. Product research is also a very important step when shopping for an item online. The Excel checklist will run you through the most important steps to consider when choosing a product. The most valuable of these steps include the examination of refund policies and warranties regarding the store and product. Keeping copies of purchase details and all receipts is also a brilliant idea in case something is misplaced during the shipping process. 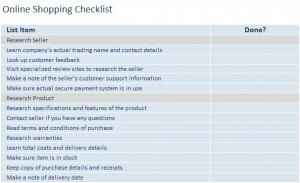 Using the Online Shopping Checklist for Excel can help you better prepare for online shopping. It will help you become a smarter shopper and aid you in making better decisions online.